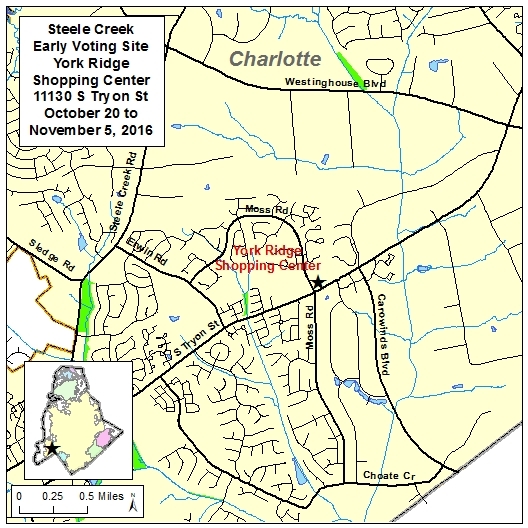 (October 10, 2016) The Mecklenburg County Board of Elections has announced that the Early Voting site for the Steele Creek area will be in a currently vacant building at 11130 South Tryon Street in York Ridge Shopping Center. This building originally was a Hollywood Video store and recently was used by Good Shepherd United Methodist Church. The new site should provide room for more voting machines than the traditional site at the Steele Creek Library. However, voters may be confused about where to vote. Friday, October 14 is the deadline to register to vote if you plan to vote by Absentee Ballot or on Election Day. 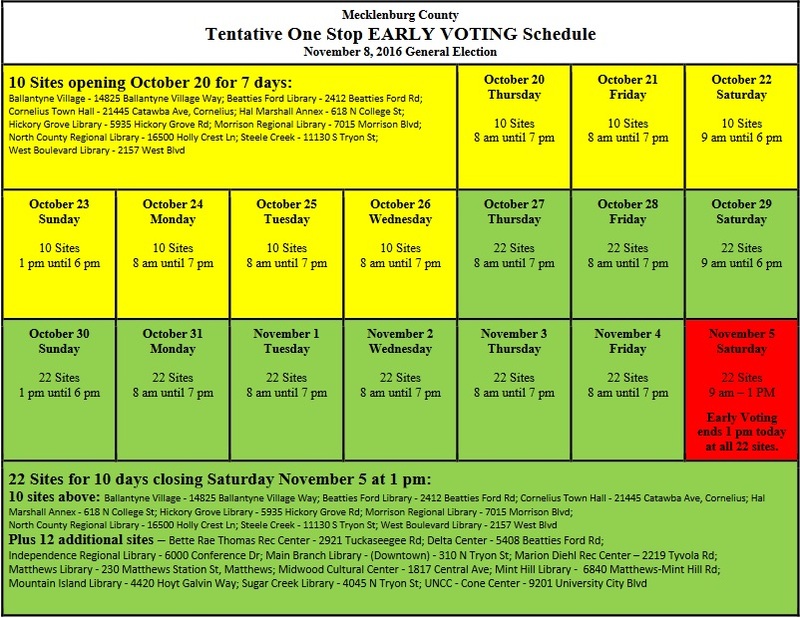 You may register during One-Stop Early Voting from Thursday, October 20 through Saturday, November 5. The North Carolina General Assembly eliminated same day registration during Early Voting, but the Federal Court ruled this unconstitutional and reinstated same day registration. Be aware, however, that there is still pending litigation regarding Early Voting. Check to make sure you are registered with your current address at the North Carolina Board of Elections web site. To download a Voter Registration Form or for other information about voter registration, visit the Mecklenburg County Board of Elections web site. Absentee Voting is available now. Anyone who will be away from home during the election, will be unable to visit a voting location, or just would prefer to vote from home may vote by Absentee Ballot. No excuse is needed to vote by absentee. Visit the Mecklenburg County Board of Elections web site to download a request form for an Absentee Ballot. November 1 is the last day to request an absentee ballot from your county board of elections. The voted ballot must be returned to the county board of elections no later than 5:00 p.m. on the date of the election. The envelope may be mailed or delivered in person to the board of elections’ office by the voter or the voter's near relative. An absentee ballot may also be delivered to an election official at a one-stop voting site during any time that site is open for voting. Ballots sent by mail must bear a postmark that is dated on or before the date of the election and be received no later than 5:00 p.m. on the third day following the election. Since the third day following the election is a holiday (Veterans Day on November 11) it appears that Absentee Ballots must be received by Monday, November 14. See the North Carolina Board of Elections web site for more information. 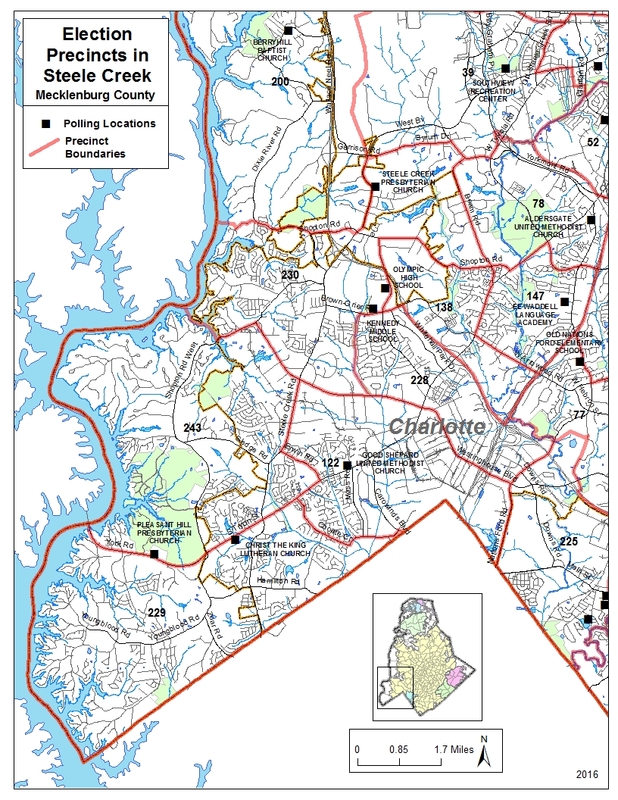 Mecklenburg County voters may vote at any Early Voting location in the county. Early Voting begins on Thursday, October 20 and extends through Saturday, November 5 at 10 sites, including the Steele Creek site at 11130 South Tryon Street. Early Voting is available at 12 additional sites from Thursday, October 27 though Saturday, November 5. You will not be required to show an ID to vote unless you are also registering during Early Voting. Because of pending litigation, the schedule is subject to change. If you vote on Election Day, you must go to your precinct's voting location. Election Day polls will be open from 6:30 AM until 7:30 PM. You will not be required to show an ID. If you do not go to your assigned voting location, you will be able to cast a Provisional Ballot. Out-of-Precinct Provisional Ballots were eliminated by the General Assembly, but the Federal Courts reinstated them. Note that the voting location for Precinct 77 remains at the old Nations Ford Elementary School at 8300 Nations Ford Road even though this school has been closed and a replacement school opened this school year. This web site will have additional information on district representatives and elections as well as bond referenda soon.